Tom has become a well-known driver and guide for our tours. But he has also shared his knowledge with tens of thousands of students through the years – but not about beer. In the latest staff profile, we will learn more about the man who has dedicated his whole life to teaching people. Tom Major of Portland, Maine, has been working as a driver and guide for The Maine Brew Bus since May of 2017. He was born in Portland, the city where he has lived throughout most of his life. After high school, Tom ventured off to attend Dartmouth College in Hanover, New Hampshire. After college, Tom returned to the area and began working at South Portland High School. His career as a bowtie-wearing History and Latin teacher flourished, and his personal life as a husband and father came to fruition. Living in Portland during that time meant that Tom was well acquainted with drinking the products from the early leaders of Maine craft beer: D.L. Geary’s, Gritty’s, Shipyard, and many more. In 2013, Tom was asked by Sean Sullivan, Executive Director of the Maine Brewers’ Guild, to write a book about the long history of brewing beer in Maine. This allowed Tom to continue to teach at South Portland while absorbing everything he could about the brewing industry in the state. His account of the history of Maine Beer in the book, titled Brewing in Maine (Arcadia Publishing) hit the shelves in early 2015 with an introduction from D.L. Geary himself. It also features a picture of two of our busses parked outside of One Industrial Way during a tour stop—long before Tom was working for us on the bus. His extensive knowledge of craft alcohol and history is on full display on the Brew Bus. With Tom as your guide, you are guaranteed to walk away knowing many new and interesting things about this beautiful and tasty world we live in! Favorite Playtime Activity (aka Hobby) – Playing with my neighbors’ dogs. Tonka is definitely a Great Dane and maybe Bulldog. And then Rocky, he’s the sweetest idiot. He’s a Boxer. Favorite Part of Being a Driver/Guide – I like making the connection between people in the brewing industry that I consider my friends and the people who are on the bus. I like being that middle-man. Favorite Experience with a Guest – I was on a tour where I was a little nervous about how things were going, and a few members of the group came over to me at that same moment and said how much they loved the stop we were at and their tour there. All the times like these remind me how great our guests are and how chill the tour is as well. Favorite Snack – Italian Sandwich. Animal Friends? – 2 cats. Mia & Tuva. Celeb Crush – Either of the Hepburns, Audrey or Katherine. 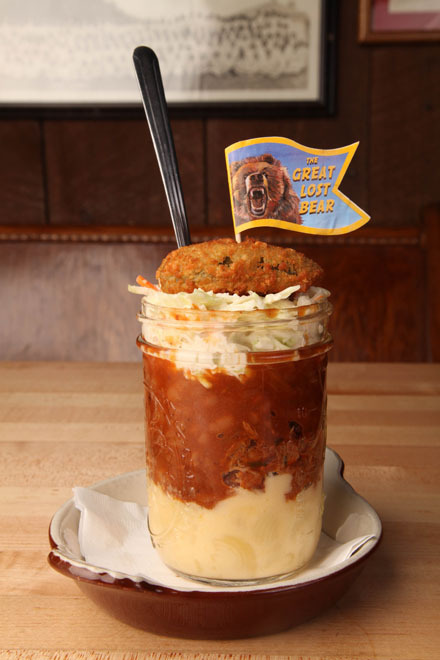 Favorite Food – ‘BBQ Hot Mess’ with Chicken from The Great Lost Bear. Favorite Band/Music/Genre – The Grateful Dead. If You Could Describe Yourself as a Local Craft Alcohol Producer or Beverage, which/what Would you Be? – I want to be Little Brett, but I’m actually just Hoppy Table Beer – both from Allagash Brewing Company. Little Brett is really singular in flavor profile and just a phenomenal beer. Hoppy Table Beer has a little less character and has the hops turned up to create that sort of veneer of character. I am by no means trashing Hoppy Table Beer. I just wish I was more singular than I am. Tom has had a couple of articles published in Beer Advocate, but all the good stories he knows don’t belong on the company website.